Middleware objects give you the ability to ‘wrap’ your application in re-usable, composable layers of Request handling, or response building logic. Visually, your application ends up at the center, and middleware is wrapped aroud the app like an onion. Here we can see an application wrapped with Routes, Assets, Exception Handling and CORS header middleware. When a request is handled by your application it enters from the outermost middleware. Each middleware can either delegate the request/response to the next layer, or return a response. Returning a response prevents lower layers from ever seeing the request. An example of that is the AssetMiddleware handling a request for a plugin image during development. If no middleware take action to handle the request, a controller will be located and have its action invoked, or an exception will be raised generating an error page. Middleware are part of the new HTTP stack in CakePHP that leverages the PSR-7 request and response interfaces. Because CakePHP is leveraging the PSR-7 standard you can use any PSR-7 compatible middleware available on The Packagist. Cake\Error\Middleware\ErrorHandlerMiddleware traps exceptions from the wrapped middleware and renders an error page using the Error & Exception Handling Exception handler. Cake\Routing\Middleware\RoutingMiddleware uses the Router to parse the incoming URL and assign routing parameters to the request. Cake\I18n\Middleware\LocaleSelectorMiddleware enables automatic language switching from the Accept-Language header sent by the browser. Cake\Http\Middleware\SecurityHeadersMiddleware makes it easy to add security related headers like X-Frame-Options to responses. Cake\Http\Middleware\EncryptedCookieMiddleware gives you the ability to manipulate encrypted cookies in case you need to manipulate cookie with obfuscated data. Cake\Http\Middleware\CsrfProtectionMiddleware adds CSRF protection to your application. Cake\Http\Middleware\BodyParserMiddleware allows you to decode JSON, XML and other encoded request bodies based on Content-Type header. 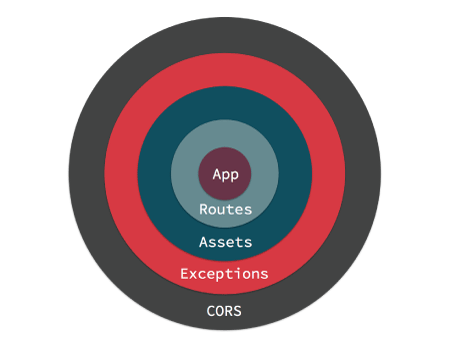 Middleware can be applied to your application globally, or to individual routing scopes. // Bind the error handler into the middleware queue. // Added middleware will be last in line. // Prepended middleware will be first in line. // bounds, it will be added to the end. // Insert before another middleware. // Insert after another middleware. // middleware will added to the end. In addition to applying middleware to your entire application, you can apply middleware to specific sets of routes using Scoped Middleware. 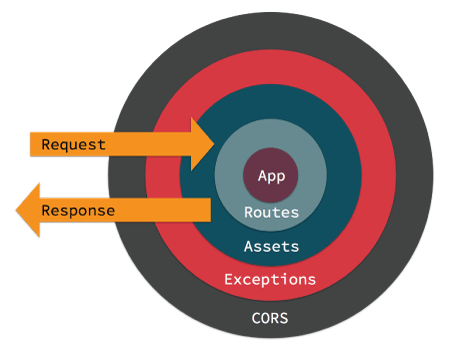 Middleware and the new HTTP stack are built on top of the PSR-7 Request & Response Interfaces. While all middleware will be exposed to these interfaces, your controllers, components, and views will not. // Read all the headers as an associative array. // Get an array of cookie values. // Read the file data. // Read data out of the URI. base contains the base directory for your application if there is one. webroot contains the webroot directory for your application. params contains the results of route matching once routing rules have been processed. session contains an instance of CakePHP’s Session object. See Accessing the Session Object for more information on how to use the session object. The methods available to create a server response are the same as those available when interacting with Response Objects. While the interface is the same the usage scenarios are different. // assigned to a variable. Middleware classes should be suffixed with Middleware. For example: LinkMiddleware. Middleware are expected to implement the middleware protocol. Middleware must implement __invoke($request, $response, $next). Middleware must return an object implementing the PSR-7 ResponseInterface. The above would use the routing cache engine to store the generated route collection. It is recommended that the encryption key you use for cookie data, is used exclusively for cookie data. The encryption algorithms and padding style used by the cookie middleware are backwards compatible with CookieComponent from earlier versions of CakePHP. CSRF protection can be applied to your entire application, or to specific routing scopes. You cannot use CsrfComponent together with CsrfProtectionMiddleware, the warning about conflicting components is not shown until 3.7.0.
expiry How long the CSRF token should last. Defaults to browser session. httpOnly Whether or not the cookie will be set with the HttpOnly flag. Defaults to false. You should apply the CSRF protection middleware only for URLs which handle stateful requests using cookies/session. Stateless requests, for e.g. when developing an API, are not affected by CSRF so the middleware does not need to be applied for those URLs. The CsrfProtectionMiddleware integrates seamlessly with FormHelper. Each time you create a form with FormHelper, it will insert a hidden field containing the CSRF token. When using CSRF protection you should always start your forms with the FormHelper. If you do not, you will need to manually create hidden inputs in each of your forms. The CSRF Token can be obtained via the Cookie csrfToken. // only JSON will be parsed. // to the callable that can parse them. // Use a CSV parsing library.